When it comes to overall health and maintaining balance, our digestive system is often one of the last things we think about. 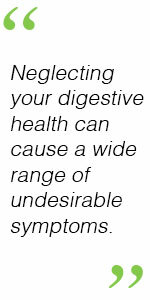 This is unfortunate, since maintaining a healthy digestive balance is an incredibly important component of any diet and nutrition regimen. Neglecting your digestive health can cause a wide range of undesirable symptoms like excessive gas, bloating, irregularity and bouts of heartburn. It’s easy to dismiss these as “normal things that happen to everyone” but in reality, these can be indicators of poor digestive health. Taking care of your digestive health is actually not all that difficult. 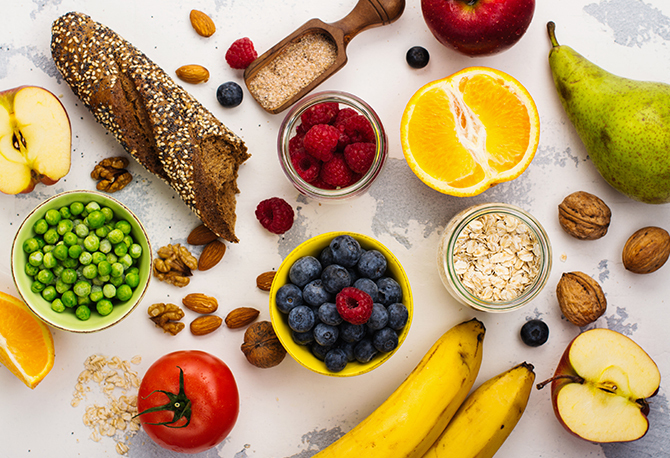 It comes down to keys like balancing your diet with nutrient-rich foods, maintaining the correct intake of fiber and fluids, exercising regularly and reducing overall stress. Your gut microbiome is an actual colony of bacteria that lives inside your intestines. As bizarre as that might seem, these bacteria are very much team players in your overall digestive health. Bacteria like Lactobacillus acidophilus help us extract the nutrients in our food, as well as help in the production of many vitamins important to our health. In addition to their nutritional duties, the bacteria in your gut microbiome help protect your digestive system from invaders like disease and harmful types of bacteria. Taking care of your gut microbiome is as easy as making sure the bacteria stay taken care of. Probiotics can encourage the proper balance of the bacteria in your gut microbiome. These are often found in fermented foods, nutritional supplements and yogurts. Fiber is another key to healthy digestion that cannot be ignored. A proper and balanced intake of the right kinds of fiber can help your digestive system with its most important tasks. Soluble fiber like that found in apples, oats, beans and similar foods is known for its tendency to thicken when exposed to water. This helps you feel more full when you eat foods containing soluble fiber. Soluble fiber can also act as a prebiotic, supporting the balance of your gut microbiome by acting as a food source for the bacteria. Insoluble fiber, on the other hand, can be found in whole-grain foods, bran and certain types of vegetables. It serves the opposite purpose as soluble fiber and keeps digested food moving through your digestive tract, thus promoting regularity. It’s this healthy balance that is crucial to maintaining your digestive health. So many factors go into maintaining your digestive health. Fiber intake and probiotics are one part of the equation. Regular exercise is beneficial as well since it can strengthen the muscles in your digestive system, improving your ability to pass food through the intestines. Stress and anxiety can also cause the digestive system to be pushed harder than normal, as your brain can send frantic signals causing your stomach to churn. Reducing your stress can take this strain off of your digestive system and return the balance you need. Keeping your digestive system working properly comes down to awareness of these key factors and maintaining a balance. Good eating, exercise, probiotics and stress reduction can all come together to give you a happy and healthy digestive system.